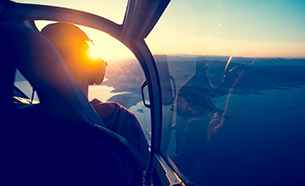 The rising demand for new materials with higher strength to weight ratios has created a dramatic growth in sandwich composite technology. Sandwich construction employs a lightweight core that has a flexural strength and flexural modulus far exceeding that of the skin laminates alone. The normal method of building a composite sandwich is to laminate the outer skin by conventional means in a mold then lay the core material into the wet laminate. The inner skin is laminated onto the top of the core material effectively sealing it. Sandwich core laminates of this type are used to stiffen various composite applications such as boat hulls, automobile hoods, molds, and aircraft panels. By increasing the core thickness, you can increase the stiffness of the sandwich without substantially increasing weight and cost. Honeycomb is a series of cells, nested together to form panels similar in appearance to the cross-sectional slice of a beehive. In its expanded form, honeycomb is 90-99 percent open space. Nomex honeycomb is fire retardant, flexible, lightweight, and has good impact resistance. It offers the best strength to weight ratio of the core materials. Nomex honeycomb is used primarily for structural applications in the aerospace industry. 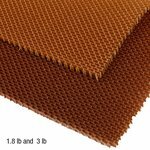 Nomex® Honeycomb Created from an aerospace-grade aramind fiber and phenolic coated paper, Nomex® honeycomb bonds well with epoxy, polyester, and vinyl ester resins. Honeycomb is carried in two densities, 1.8 lbs/cubic foot and 3.0 lbs/cubic foot. 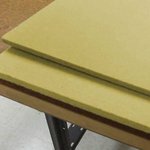 Vinyl sheet foam is one of the most versatile core materials on the market. It is a rigid, closed cell material that resists hydrocarbons, alkalis, dilute acids, methyl alcohol, sea water, gasoline, diesel oil, and it is self extinguishing. It has been used extensively in aircraft and performance automotive structures, but it can be applied anywhere that high properties and easy handling are needed. Vinyl foam can be thermoformed in an oven or with a heat gun while applying gentle pressure. For ultimate peel strength, use a perforation roller to increase the surface area of the foam. The peel strength will increase an additional 15-20% after perforation. Divinycell Vinyl Foam Closed cell vinyl foams are valued for their superior structural and mechanical properties, often used for weight-sensitive aircraft and automotive applications. 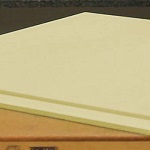 Fibre Glast Carries Vinyl Foam Sheets in three, four, and five pound densities. End-grain balsa is the most widely used core material. It is both a relatively high strength core and less expensive than vinyl or honeycomb. It achieves its high compression strength because on a microscopic level it has a honeycomb type of structure yet is quite dense. It is easy to cut and bevel and is available in 24 x 48 inch sheets. The individual small blocks of end grain balsa are bonded to a light scrim fabric which makes the sheet quite flexible. 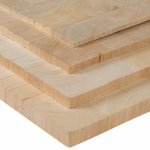 End-Grain Balsa Balsa wood remains one of the most popular core materials in the industry, thanks to its moderate strength and affordability. Fibre Glast carries balsa in 1/4", 3/8" and 3/4" varieties. Each sheet measures 2 ft x 4 ft; with 9 1/2 lb/cubic foot density. This sheet foam is a rigid, closed cell material with excellent thermal insulation and flotation properties. 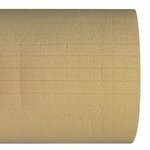 This core has been at the heart of the marine industry for decades and is fairly inexpensive when a lower property cored laminate is needed. It is compatible with both polyester and epoxy resin systems. This foam is a rigid, closed cell material with excellent thermal and floatation properties. While it is not generally suited to the classic sandwich core laminate described in this brochure, it can be poured into any closed cavity to stiffen the structure. The free rise density is 2 lbs. per cubic foot, but closed mold techniques can increase the density when required. 2 lb. Mix and Pour Foam This 2 lb. density foam comes as a two-part kit, both parts equally mixed. It is a closed-cell system. Delivering 60 pounds of float per cubic foot. It can be used to fill cavities for reinforcement and insulation, and can be shaped or carved, once cured. 6 lb. Mix and Pour Foam This 6 lb. density foam comes as a two-part kit, both parts equally mixed. It is a closed-cell system. Delivering 60 pounds of float per cubic foot. Offering superior compressive strength (120 psi), so it's ideal filling cavities that will be used to support a heavy load. To maintain the effectiveness of the sandwich structure three conditions must be met. First, the core must be strong enough to withstand the compressive or crushing load placed on the panel. If the core collapses, the mechanical stiffness advantage is lost. Second, the load bearing skins must form a rigid bond to the core surfaces so the skins don't creep or peel during use. This interface is called the BOND LINE. Finally the core must resist the shear forces involved. If the core shears, the skins shift and the mechanical advantage is again lost. Once the proper core material has been selected based upon compressive and shear strengths, the skills of the fabricator become critical in determining the quality of the bond line. Here are some helpful hints for maximizing the strength of the bond line. 1.Carefully bevel the edge of the core. 2.Reinforce all holes cut or drilled through the core.